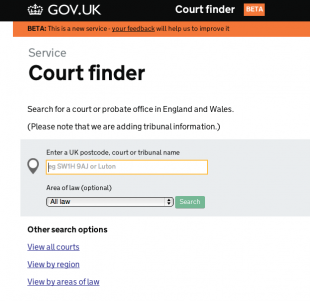 In August 2013 we built a new court finder service - giving contact details and information about courts in England and Wales. We provided a much better search facility, and clearer info on the venues - including which court to go to for a legal problem, based on geographical jurisdiction. The next step was to empower the people who own the information to take control of the service, so they can make instantaneous updates on courts and tribunals in their area. Staff in the regional support units now no longer have to write into MOJ or HMCTS HQ to ask for changes to phone numbers or add urgent updates to court opening times. This will avoid many of the traditional pitfalls of centralised web publishing, which can be complex, slow and prone to error. 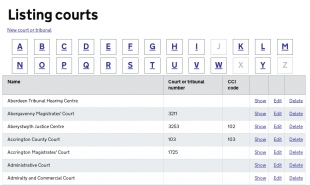 We've made publishing easy so that court staff can concentrate on providing the right facts, and not worry about the formatting or categories. Content designer Graham Lee helped standardise the templates in the publishing interface. Developers Mat, Hrishi and Jairo did the rest. We would not have gotten to where we are without the help of two key supporters from the courts - Jo Nowakowska and Julie Copley. With their vast knowledge of how the court system works they quickly appreciated the value that comes with empowering courts to manage their own information. We'll be listening to customer feedback to make more improvements over the next few months. These will include adding tribunals to the service and tweaking the jurisdictional mapping to reflect changes to the family courts in April. Excellent work. As someone who used to work on the front line at the Probation Service I know how much this is an improvement over having to look things up in a book as we did back then. Making it available to the public will significantly reduce the number of calls PO staff have to deal with.